Customer journey mapping is a major component of any customer experience program. Of course, a key part of mapping the customer experience includes identifying key moments of truth or moments of consumer brand interaction that shape brand perception and loyalty. In the digital age, many key moments of truth for your customers are happening online. This means that more and more of your consumers, brand perceptions and attitudes will be based on purely digital interactions (in-app, website, wearable tech, etc.). This has made understanding your customers’ digital interactions an essential part of any customer experience program. “It has been said that VOC programs without a web presence engage only 2% to 10% of those who interact with their website” (marketing sherpa). As we move into the future, this trend will continue. We know that mobile is an inherent part of today’s digital experience. Global mobile and tablet internet usage just exceeded desktop use for the first time (GS StatCounter, 2016) and we also see that 82% of consumers turn to mobile to help make a product decision (Google/Ipsos, 2015). So it’s really no longer a question—these digital moments, across platforms (mobile, tablet, or desktop) are shaping essential KPIs that will ultimately inform the path to purchase. A mobile-first mindset matters today more than ever before. 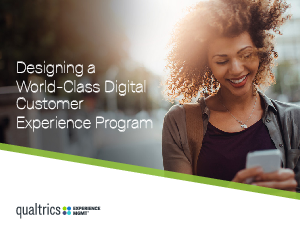 Viewing onsite customer experience through the lens of your analytics is extremely valuable. However, only looking at what customers do on the site will inevitably leave gaps in your knowledge. In order to truly optimize the customer experience onsite, you will need to talk directly to the customer so as to fill in the gaps left by analytics alone.